Cherrytec uses the Scrum Methodology for both bespoke application and product development. The Agile development approach is optimized for handling changing requirements even late in a development phase. Early and continuous delivery of working software ensures that both customer satisfaction and team motivation remain high. 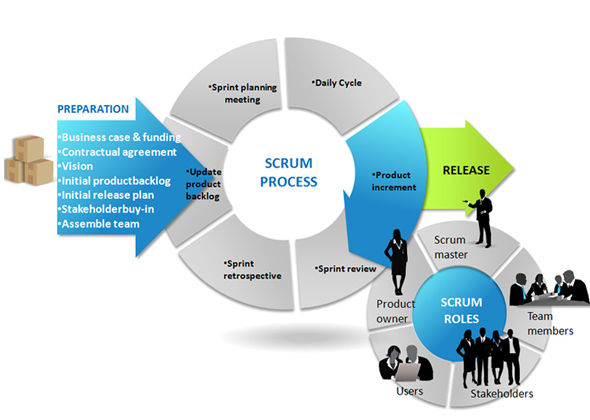 Scrum employs real-time decision-making processes based on actual events and information. This requires well-trained and specialized teams capable of self-management, communication and decision-making. The teams in the organization work together while constantly focusing on their common interests. Initial appointment of a project manager called the "scrum master." Definition and prioritization of tasks to be done. Planning sessions for each task. Identification and evaluation of potential project risks and process pitfalls. Execution of projects in brief, high-intensity, frequent work sessions. Reviews of progress and evaluations of completed projects. Openness to constructive criticism and ideas for improvement. Utilization of techniques such as re-factoring, pair programming, early testing, and frequent builds result in significant reduction in defects while providing higher transparency and lower risks and costs. And to top it all - the need to maintain a constant pace necessitates close interaction between all stakeholders and makes the entire custom application development process simply more dynamic! Scrum emphasizes the idea of “empirical process control.” That is, Scrum uses the real-world progress of a project — not a best guess or uninformed forecast — to plan and schedule releases. In Scrum, projects are divided into succinct work cadences, known as sprints, which are typically one week, two weeks, or three weeks in duration. At the end of each sprint, stakeholders and team members meet to assess the progress of a project and plan its next steps. This allows a project’s direction to be adjusted or reoriented based on completed work, not speculation or predictions. This emphasis on an ongoing assessment of completed work is largely responsible for its popularity with managers and developers. But what allows Scrum to work is a simple set of roles, responsibilities, and meetings that never change. If Scrum’s capacity for adaption and flexibility makes it an appealing option, the stability of its practices give teams something to lean on when development gets chaotic. Cherrytec software development is aided by Quality Assurance and Software Testing. Our QA and Software testing capabilities are highly regarded in the industry due to the stringent methods and documentation followed. Our quality assurance supports the manner of all development processes from the outset.